Background & objectives: Many essential oils have been reported as natural sources of insect repellents; however, due to high volatility, they present low repellent effect. Formulation technique by using microencapsulation enables to control the volatility of essential oil and thereby extends the duration of repellency. In this study, the effectiveness of microencapsulated essential oils of Alpinia galanga, Citrus grandis and C. aurantifolia in the lotion formulations were evaluated against mosquito bites. Methods: Essential oils and W,W-Diethyl-3-methylbenzamide (DEET) were encapsulated by using interfacial precipitation techniques before incorporation into lotion base to form microencapsulated (ME) formulation. The pure essential oil and DEET were also prepared into lotion base to produce non-encapsulated (NE) formulation. All the prepared formulations were assessed for their repellent activity against Culex quinquefasciatus under laboratory condition. Field evaluations also were conducted in three different study sites in Peninsular Malaysia. In addition, Citriodiol® (Mosiquard®) and citronella-based repellents (KAPS®, MozAway® and BioZ Natural®) were also included for comparison. Results: In laboratory conditions, the ME formulations of the essential oils showed no significant difference with regard to the duration of repellent effect compared to the microencapsulated DEET used at the highest concentration (20%). It exhibited >98% repellent effect for duration of 4 h (p = 0.06). In the field conditions, these formulations demonstrated comparable repellent effect (100% for a duration of 3 h) to Citriodiol® based repellent (Mosiguard®) (p = 0.07). In both test conditions, the ME formulations of the essential oils presented longer duration of 100% repellent effect (between 1 and 2 h) compared to NE formulations. Interpretation & conclusion: The findings of the study demonstrate that the application of the microencapsulation technique during the preparation of the formulations significantly increases the duration of the repellent effect of the essential oils, suggesting that the ME formulation of essential oils have potential to be commercialized as an alternative plant-based repellent in the market against the mosquitoes. Mosquitoes are small insects, distributed all around the world and their hovering and biting activities cause annoyance and allergic reactions. More importantly, some mosquitoes are vectors of several different deadly diseases, and therefore, they are considered as the worst enemy in the fight against global infectious diseases. Mosquito-borne diseases have caused millions of deaths worldwide every year with a disproportionate effect on children and the elderly especially in the developing countries. There are >3000 species of mosquitoes, but only species from four genera, namely Aedes, Culex, Anopheles, and Man-sonia are primarily responsible for the spread of different diseases to humans. Aedes mosquitoes transmit yellow fever, dengue fever and encephalitis; Anopheles mosquitoes transmit malaria and some species are vectors of bru-gian and bancroftian filariasis; Culex mosquito also can transmit bancroftian filariasis and encephalitis whereas Mansonia spp are known to transmit brugian filariasis and few arbovirus diseases. The personal protection by using insect repellent is regarded as the first line of defense against mosquito bites. Other preventive measures include behavioural practices (i.e. destruction of mosquito habitats and prevention from mosquito bites and use of physical barriers (e.g. protective clothing and bednets),. Personal protection helps prevent man-mosquito contact and thereby minimize the possibility of mosquito-borne diseases infection. Synthetic repellents, such as 7V,jV-Diethyl-3-methylbenzamide (DEET), are used worldwide for protection against mosquito bites. Although, DEET is proven effective, it comes with certain drawbacks such as emitting an unpleasant odour and leaving a greasy feel on the skin. It is also found to exhibit high level of skin penetration, causing allergic or toxic reactions to the skin. As a result, DEET-free repellents are more favoured by consumers and the demand for formulations containing natural products are now increasing. Over the last 50 yr, thousands of plants have been screened as potential sources for repellents and insec-ticides. Essential oils from these plants are among the most useful sources and some of them have been used as active ingredients in repellent products such as citro-nella, lemongrass, pyrethrum, and geranium oils. These essential oils have been reported to have repellent effect against variety of mosquito species; however, the effectiveness was not found to last for longer duration. Some essential oils were reported to have a repellent effect for < 2 h. A previous study showed that this decrease in the duration of repellent effect is due to the high volatility, biodegradability, thermal decomposition, and poor physicochemical stability nature of the essential oils that make them unstable. It is therefore, crucial to consider on improving the stability of the essential oils, if they are to be used as active ingredients in the development of botanical repellents so that the level of effectiveness in the final use is comparable to that of the synthetic repellents,. Apart from searching for possible plant essential oils that could offer repellent effect for longer duration, the improvement of the formulation technique in the production of plant-based repellents could also help improve the duration of the repellent effect. Microencapsulation technique is one of the latest technologies used in the development of plant-based repellent products. This technique encapsulates or entraps the plant’s active ingredient within the shell or wall materials using a natural or synthetic polymer to form microcapsules. Microcapsules are sized between 1 and 1000 μιη; and consist of two parts–the core (internal part) that contains the active ingredient and the shell (external part) which is made up of polymer. The presence of a shell surrounding the essential oil improves its potency by preventing evaporation and it also controls the volatility (i.e. release) of the essential oil. Furthermore, this shell also helps to improve the physico-chemical stability of the essential oils by protecting them from oxidation caused by heat, moisture, and contact with other substances over a long shelf life, thus, improving the efficacy of the essential oil in the repellent product,,. In this study, essential oils from the rhizome of Alpin-ia galanga, fruit peel of Citrus grandis, and leaves of C. aurantifolia were encapsulated via interfacial precipitation technique in order to produce plant-based repellents that could have a longer duration of repellent effect. The microencapsulated (ME) and non-encapsulated (NE) essential oils and DEET were formulated in the lotion form and tested for their repellent effect against Culex quin-quefasciatus in laboratory and against various species of mosquitoes in field conditions. For comparison purposes, other marketed plant-based repellent products containing citronella (KAPS®, MozAway® and BioZ Natural®) and Citriodiol® (Mosiguard®) as active ingredients were used. Fruit of C. grandis and rhizome of A. galanga were purchased from a wholesale market in Selangor, Malaysia. Leaves of C. aurantifolia were obtained from the Felda settlement Cluster, Kota Tinggi, Johor, Malaysia. These plant materials were cut into small pieces and subjected to hydrodistillation in a Clevenger-type apparatus for 6 h to obtain the essential oils. The extracted oils were dried over anhydrous magnesium sulfate (Sigma-Aldrich, USA) in order to extract the oils from the aqueous phase before being stored in an airtight bottle at 4°C to be used later for formulation. Graded concentrations (5, 10, 15, and 20% w/v) of the essential oils and DEET were encapsulated using in-terfacial precipitation chemistry technique, to form a polysaccharide film around the droplet. In brief, formation ofmicrocapsule walls is a two step process, which involved reacting the amphiphilic macromolecule carboxy-methylcellulose (CMC) with the complementary reactant benzalkonium chloride (BKC). The first step involved the formation of emulsions containing droplets of water-immiscible core material, i.e. the essential oil, in a first wall-forming reactant solution (CMC) that preferentially accumulated at the droplet surface by polar solvent forces. The second step involved the addition of the second wall forming reactant (BKC) to the system that spontaneously precipitated the CMC to form a membrane-like wall that surrounded each droplet. [Table 1] shows the amount of each composition added during encapsulation process. An additional amount of distilled water was added at the end of the process in order to account for water loss during the formulation process. The microencapsulated active ingredients were then formulated into a lotion base in order to produce a cosmetic repellent product that not only repels mosquitoes but also moisturizes the skin. First, emulsifying wax (2.5 g), stearic acid (5 g), shear butter (10 g), cocoa butter (5 g), coconut oil (2.5 g), sweet almond oil (10 g), and jojoba oil (5 g) were mixed together using a propeller at 400 rpm at 70°C. The mixture was then allowed to cool to 45°C before glycerin (5 g), aloe vera gel (5 g), and a microen-capsulated active ingredient (essential oil/DEET) (50 g) were added while continuously stirring until a uniform mixture was produced (ME formulation). For the NE formulation, a similar procedure was used in which 20% of the active ingredient was added into the mixture to replace the microencapsulated active ingredient. Mosquitoes for testing the repellent efficacy study were provided by the Institute for Medical Research in Kuala Lumpur, Malaysia. Susceptible strain and nul-liparous Cx. quinquefasciatus adults (3-7 days old) were used as test species. To evaluate the repellent activity for each formulations, the methods developed/formulated by the Malaysian Standard Method for repellent MS 1497 : 2000 was applied. Bioassays were conducted using a 60 × 60 × 60 cm screened cage with two 15 cm diam circular openings fitted with cloth sleeves. The cage had two compartments separated with a clear acrylic plastic in the middle. A fresh batch of 25 female Cx. quinque-fasciatus was introduced into each compartment through the circular opening. Two 25 cm2 areas were drawn on the back of each forearm of the human volunteers. One area was untreated (control); the other was pre-treated with 0.4 g of a test formulation (treatment). To test for any inherent repellency characteristics of the lotion base (formulation without active ingredient), the mean landing rate per min for Cx. quinquefasciatus was recorded. Total five volunteers were applied with 0.4 g of lotion base in the treatment area, while the other area was left untreated (control). Prior to treatment, both hands were covered with rubber gloves with a 25 cm2 opening corresponding to the marked area to confine mosquito bites only to the exposed areas. Both hands were exposed simultaneously in a cage for 1 min and the number ofmos-quito lands and/or bites was recorded. The procedure was repeated five times with 5 min interval between each exposure. For testing the essential oil-based lotion formulations, similar procedure was adopted; however in this case the exposure time was 3 min and the assessment periods were 1, 2, 4, 6, and 8 h post-application. The experiment was repeated with encapsulated DEET-based formulation as a positive control. For comparison purposes, non-encapsulated formulations (extracted essential oil and DEET) and four marketed plant-based repellents, namely KAPS® (containing 600 mg citronella oil, 450 mg jojoba oil, and 60 mg tea tree oil), MozAway® (15% citronella oil and 2% neem oil), BioZ Natural® (1.19 g citronella oil, 0.17 g lemongrass oil, and 0.17 geranium oil), and Mosiguard® (30% Citriodiol®) were also included in this study. Each formulation was tested thrice on five human volunteers. The effectiveness of the repellent was determined using the formula stated in data analysis part. Study sites: The field evaluation was conducted in various areas in Peninsular Malaysia having zero or minimal risk of mosquito transmitted diseases. The information regarding these locations was obtained from the Ministry of Health, Malaysia (MoH). The three locations were selected and preliminary studies using human-bait landing catches were carried out to determine the mosquito population density with a broad spectrum of mosquito species in the selected areas. Based on this preliminary study, Kampung Paya Rumput Jaya, Sungai Udang, Melaka; Kampung Pokok Asam, Sungai Petani, Kedah; and Felda Purun, Bera, Pahang were selected for this study. Kampung Paya Rumput Jaya, Sungai Udang (2°16’22”N–102°9’7”E) is located in Melaka, approximately 21 km away from Melaka’s capital. People in this village are mostly involved in agriculture and farming activities. The study spots for evaluation were surrounded by fruit plantation. Kampung Pokok Asam (5°34’49”N–100°28’16”E) is situated in Sungai Petani, Kedah, approximately 8 km away from Sungai Petani town and 74 km from the state’s capital, Alor Setar. People in this village are mostly involved in agriculture, like paddy farming and the study spots selected for field evaluation are located nearby paddy fields. Felda Purun (3°22’32”N–102°37’51”E) is one of the FELDA (Federal Land Development Authority) settlements situated in Bera, Pahang. It is approximately 32 km away from the nearest town, Bera New own, and 161 km from the state’s capital, Kuantan. Most of the people in this settlement are involved in the palm oil industry and the study spots selected for field evaluation are surrounded with palm oil and swamp area. Test procedure: The field evaluation was conducted based on the WHO methodology. The essential oils and DEET-based formulations that demonstrated the longest repellent effect established from laboratory bioassays were selected for field evaluation. For every study site, 13 volunteers were recruited in the study. Each volunteer was positioned at 13 different spots and each of them was tested with different treatments while one volunteer was not treated (control). One gram of formulation was applied evenly from the knee down to the ankle of each leg. Shorts and shoes were used to standardize the exposure area. Other exposed parts of the body were covered using jacket with hood, gloves, or plastic sheet for protection against mosquito bites. Care was taken to minimize contact of the treated legs with clothing between tests. All volunteers were seated on chairs, at least 10 m apart and both legs were exposed for a period of15 min. Mosquitoes that landed on and/or bite the volunteers were captured using vials and with the help of flashlights, and then transferred into separate cups for counting and identification. Each exposure period followed a 10 min break before the next mosquito collection was carried out. After each 20 min period, the volunteers were moved to a new site which was at least 10 m away from the last spot. The test started at 1630 hrs and continued until 2130 hrs and was performed for 13 nights. Each night, the volunteers received a different treatment and similar steps were followed. Where, C is the total number of mosquitoes that landed on and/or bite the control arm and T is the total number of mosquitoes that landed and/or bite the treated arm. For testing repellency of lotion base, the mean number of mosquito landed on and/or bite on treated and untreated areas was compared using analysis of variance (ANOVA) using SPSS v. 22 software to determine any significant differences (p<0.05). For essential oil, DEET-based lotion formulations, and repellent products; the percentage of mosquitoes that landed and/or bite reduction data was analyzed by split-plot ANOVA (SPANOVA) to identify the mean differences between each formulation over time. Prior to this analysis, data was transformed using arcsine-square root transformation to reach better parametric assumptions. A value ofp <0.05 was considered statistically significant. The Faculty of Medicine of University of Malaya Research Ethics Committee (No: 988.11) granted ethical approval for the study. Statistically, no significant difference was observed between the mean landing rate per min of Cx. quinquefas-ciatus on the lotion base area and untreated area [Figure 1]. This indicated that the lotion base did not possess inherent repellency property and therefore did not affect the repel-lency response of the essential oils and DEET. Figure 1: Mean landing rate of Cx. quinquefasciatus on area treated with lotion base and untreated area (Control). No significance was detected between lotion base and control. Error bars indicate standard error mean (SEM). 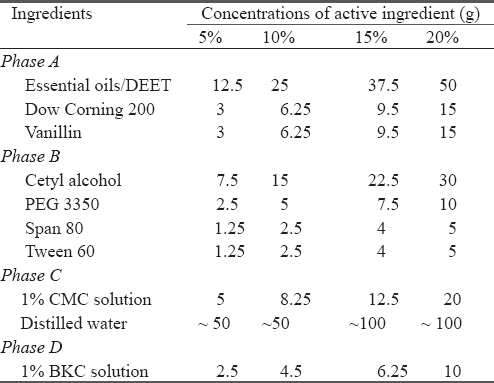 The repellent effect of the essential oil-based formulations in the laboratory condition is shown in [Table 2]. For all the concentrations tested, the ME formulation of A. galanga demonstrated 2 h of 100% repellent effect against the mosquitoes. At the highest concentration (20%), >80% of repellent effect was maintained up to 8 h post-application, while at 15% concentration, >80% repellent effect was maintained up to 6 h.
At 20 and 15% concentrations, the ME formulation of C. grandis presented 100% repellent effect for 2 h post-application. More than 80% repellent effect was observed up to 6 h post-application, which after 8 h decreased to not less than 75%. At 10 and 5% concentrations, 100% repellent effect was observed for 1 h only. The ME formulation of C. aurantifolia presented a repellent effect that was almost similar to that of the C. grandis formulation. NE formulations of A. galanga, C. grandis and C. au-rantifolia at 20% concentration also demonstrated 100% repellent effect, but they lasted only for 1 h post-application. For ME formulation of DEET, at 20 and 15% concentrations, 100% repellent effect was observed for 4 h and for the following 4 h the repellent effect only reduced slightly to 90.92%, and 84.43%, respectively. At 10 and 5% concentrations, 100% repellent effect was observed for 2 h post-application which reduced gradually to 80.12 and 77.05% at 8 h post-application, respectively. Comparison between the ME formulations of essential oils and DEET showed that at 20% concentration, there was no significant difference between the two in terms of repellent effect against Cx. quinquefasciatus within 4 h post-application (p = 0.06). 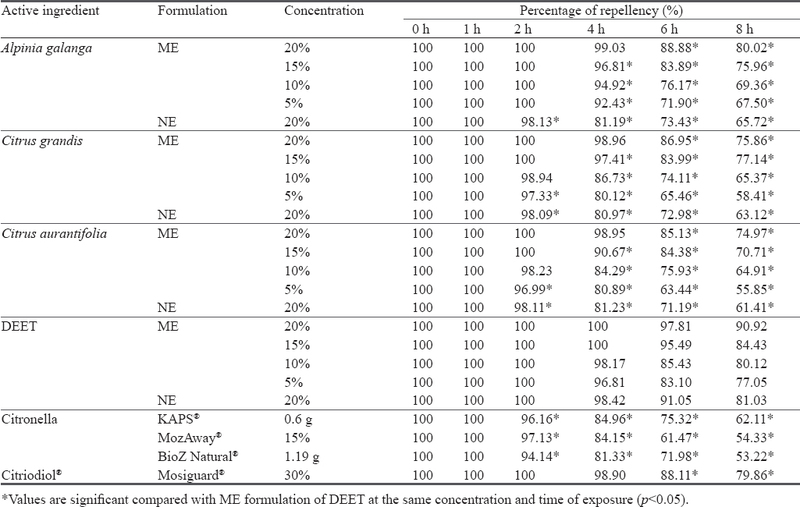 However, repellent effect at 6 h and 8 h post application showed that the ME formulation of DEET was significantly better than the essential oil-based formulations (p = 0.03). When a comparison was made between ME formulations of essential oils with citronella-based repellents (KAPS®, MozAway®, and BioZ Natural®) the repellent effect of ME formulations of the essential oils were found to be significantly better (p<0.05). KAPS®, MozAway®, and BioZ Natural® demonstrated 100% repellent effect against Cx. quinquefasciatus for only 1 h post-application. Comparison with Mosiguard® (Citriodiol® based repellent), showed that ME formulations of essential oils showed a comparable repellent effect at 20 and 15% concentrations. The status of mosquito density in the study areas was determined as shown in [Table 3]. Four genera of mosquitoes were detected, namely Armigeres, Aedes, Culex, and Mansonia. Aedes albopictus was the predominant mosquito followed by Ae. subalbatus, Culex and Mansonia spp. Highest mosquito density (2137) was found in Felda Purun followed by Kampung Pokok Asam, and Kampung Paya Rumput. All formulations tested in the field were used at 20% concentration. The repellent effect of ME and NE formulations of essential oils and DEET, KAPS®, MozAway®, BioZ Natural®, and Mosiguard® tested at Kampung Paya Rumput, Kampung Pokok Asam, and Felda Purun are shown in [Table 4], [Table 5] and [Table 6], respectively. Based on the results obtained, repellent effect ofME and NE formulations of essential oils and DEET indicated a pattern which was almost similar for all study sites. Among the three ME formulations of essential oils, only A. galanga demonstrated 100% repellent effect up to 3 h post-application, whereas for ME formulations of C. grandis and C. aurantifolia, the 100% repellent effect lasted for 2 h post-application. It can be observed that the ME formulation of plant’s essential oils presented significantly better repellent effect compared to citronella-based repellents (KAPS®, MozAway®, and BioZ Natural®) in all study sites (p >0.05). These citronella-based repellents presented 100% repellent effect against mosquito bites for only 1 h post-application and at 1 h post-application it reduced to around 50%. Unlike these repellents, for the ME formulations of plant essential oils, at 5 h post-application, the repellent effect remained at ~80%. As expected the NE formulations of all essential oils showed the shortest 100% repellent effect (lasted for only 1 h), which is similar to that of all marketed plant-based repellents included in this study except for Mosiguard®, which demonstrated a repellent effect similar to that of the ME formulation of A. galanga. In addition, at 5 h post-application all ME formulations of the essential oils presented comparable effect with Mosiguard®. ME formulation of DEET demonstrated the longest 100% repellent effect, which was maintained up to 4 h post-application and most likely is the best among all formulations tested where only a slight reduction (4.3%) was observed at 5 h post-application. Plants essential oils are rich sources of many compounds, such as hydrocarbon terpenes and terpenoids, which can be utilized in the development of alternative repellents to synthetic repellents. However, studies have shown that repellents based on essential oils generally do not provide sufficient repellent effect against mosquito bites (in terms of 100% repellent effect maintained for a long duration) compared to what is provided by DEET, which provides between 6–8 h of complete (100%) repellent effect. It is well understood that such limitation is caused by the high volatile nature of the essential oils. In order to overcome this limitation, the techniques applied in the production of plant-based repellents are making use of fixative materials such as vanillin, polymers, and adjuvant to control the volatility of the essential oils.Although, such fixative materials were shown to have helped in increasing the repellent effect of the formulations (compared to their pure oil form), the duration of the repellent effect achieved is yet to match the duration of the synthetic repellent. Most of the plant-based repellent products in the market have < 2 h of 100% repellent effect. Hence, several formulation techniques have been developed to improve current techniques such as the mi-croencapsulation technique. This study reports that the use of microencapsulation technique, helped to extend the duration of the repellent effect of the formulations prepared. Both evaluations, i.e. in laboratory and field conditions, demonstrated that the ME formulation increased the duration of the repellent effect between 1-2 h more than the NE formulation for all the essential oils. The presence of the wall surrounding the essential oil droplets produced by microencapsulation is shown to have provided several advantages to the formulations. The use of this method not only created better controlled release of the essential oil, but the larger droplet size of the microcapsules formed also tend to inhibit skin penetration, therefore decreasing the amount of metabolites of the essential oil that might penetrate into the skin resulting in reduction of allergic and toxicity effects on the skin. In addition, the polymer added in the formulation provides skin resistance effect to the formulation by reducing the wash out effect from perspiration, thus, allowing more essential oil to be retained on the skin for action against mosquito bites, hence extending the duration of required repellent effect,. During the laboratory evaluation, it was demonstrated that all ME formulations of essential oils presented excellent repellent effect (at 20% concentration, >98% repellent effect was maintained for 4 h). Among the formulated essentials oils, the ME formulation of A. galanga offered the most promising repellent effect followed by C. grandis and C. aurantifolia. Even at 10% concentration, A. galanga provided 100% repellent effect for 2 h. Previous study reported that at a similar concentration, A. galanga oil formulated in absolute ethanol and additives (vanillin, propylene glycol, and polyethylene glycol) provided only about 30 min of repellent effect against Ae. aegypti. In the case of Citrus spp., it was reported that a formulation containing 10% C. reticulate peel essential oil in olive oil provided only 1.5 h of repellent effect against Cx. quinquefasciatus. These findings suggested that the formulation prepared using the microencapsulation technique showed better repellent effect when similar concentrations were used in formulation. The results obtained from the field evaluation demonstrated that all ME formulations of essential oils showed significant differences compared to ME formulation of DEET. For a long time, DEET has been recognised as the gold standard for repellents known to provide 100% repellent effect for as long as 6 h in field conditions. As a synthetic repellent, DEET is more stable in the environment and has low volatility effect compared to essential oils. In addition to that, factors such as environmental conditions (temperature and humidity) and the volunteers’ perspiration are believed to have exaggerated the poor physicochemical properties possessed by the essential oils. Interestingly, even though the ME formulation of essential oils did not perform as good as the ME formulation of DEET, nevertheless, the ME formulation of A. galan-ga did show comparable effect compared to Citriodiol®-based repellent (Mosiguard®) by providing complete repellent effect for 3 h. When the time of exposure was extended to 6 h, all the ME formulations of essential oils presented comparable repellent effect (> 80%) to Mosi-guard®. These findings proved that microencapsulation was able to prolong the release rate of essential oils and produced results similar to Mosiguard®. Citriodiol® or p-methane-3,8-diol (PMD) is one of the two botanical insecticides besides 3-[N-butyl-N-acetyl]-amino-propionic acid and ethyl ester (IR3535) that are recommended by the US Center for Disease Control (CDC) for use in endemic areas as an alternative to DEET,. Having comparable effect with the Citriodiol®-based repellent, the ME formulations of essential oils, especially A. galanga, is therefore, suggested as the most potential candidate to be studied further for the development of alternative repellents. This study also found that in laboratory and field conditions, all the ME formulations of essential oils demonstrated repellent effect that was better than citro-nella-based repellents (KAPS®, MozAway®, and BioZ Natural®). A previous study also reported that most of the commercial citronella-based repellents tested are capable to provide 100% repellent effect only for short duration (half an hour), which is in agreement to this study. Overall, this study demonstrated that the repellent effect of the A. galanga, C. grandis and C. aurantifolia essential oil were improved after being encapsulated. The efficacy study in the laboratory and field conditions indicated that ME formulation of essential oils presented better repellent effect compared with NE formulation against mosquito bites. Even though the effectiveness of this formulation could not match the ME formulation of DEET, it showed comparable effect with Citriodiol®-based repellent (Mosiguard®), suggesting that the ME formulation of essential oils have potential to be commercialized as an alternative plant-based repellent in the market against the mosquitoes. More investigation on the improvement of the formulation technique is necessary to increase the repellent effect of essential oil so that it should be on par with DEET. The authors are thankful to the University of Malaya for financially supporting this study through Postgraduate Research Grant (PPP) PG085-2012B and the Institute of Medical Research, Malaysia for providing research facilities. Tolle MA. Mosquito-borne diseases. Curr Probl Pediatr Ado-lesc Health Care 2009; 39(4): 97-140. Norris DE. Mosquito-borne diseases as a consequence of landuse change. Eco Health J 2004; 1: 19-24. Rueda LM. Global diversity of mosquitoes (Insecta: Diptera: Culicidae) in freshwater. Hydrobiologia 2008; 595: 477-87. Freedmann DO. Malaria prevention in short-term travelers. N Engl J Med 2008; 359: 603-12. Maguranyi SK, Web CE, Mansfield S, Russell RC. Are commercially available essential oils from Australian native plants repellent to mosquitoes? J Am Mosq Control Assoc 2009; 25(3): 292-300. Katz TM, Miller JH, Heber AA. Insect repellents: Historical perspectives and new developments. J Am Acad Dermatol 2008; 58: 865-71. Nerio LS, Oliver-Verbel J, Stashenko, E. Repellent activity of essential oil: A review. Bioresour Technol 2010; 101(1): 372-8. Maia MF, Moore SJ. Plant-based insect repellents: A review of their efficacy, development and testing. Malar J 2011; 10: S11. Soonwera M, Phasomkusolsil S. Efficacy of Thai herbal essential oils as green repellent against mosquito vectors. Acta Trop 2015; 142: 127-130. Bilia AR, Guccione C, Isacchi B, Righeschi C, Firenzuoli F, Bergonzi MC. Essential oils loaded in nanosystems: A developing strategy for a successful therapeutic approach. Evid Based Complement Alternat Med 2014; 2014: 1-14. Isman MB. Botanical insecticides, deterrents, and repellents in modern agriculture and an increasingly regulated world. Annu Rev Entomol 2006; 51: 45-66. Tramon C. Modelling the controlled release of essential oils from a polymer matrix–A special case. Ind Crops Prod 2014; 61: 23-30. Mishra MK. Overview of encapsulation and controlled release. In: Mishra MK, editor. Handbook of encapsulation and controlled release. United States of America: CRC Press 2016; p. 3-5. Martins IM, Barreiro MF, Coelho M, Rodrigues AE. Microen-capsulation of essential oils with biodegradable polymeric carriers for cosmetic applications. Chem Eng J 2014; 245: 191-200. Fernandes RVB, Borges SV, Botrel DA, Gum arabic/starch/ maltodextrin/inulin as wall materials on the microencapsulation of rosemary essential oil. Carbohydr Polym 2014; 101: 524-32. Wang SY, Lai WC, Chu FH, Lin CT, Shen SY, Chang ST. Essential oil from the leaves of Cryptomeria japonica acts as a sil-verfish (Lepisma saccharina) repellent and insecticide. J Wood Sci 2006; 52: 522-6. Kasting GB, Bhatt VD, Speaker TJ. Microencapsulation decreases the skin absorption of N,N-diethyl-m-toluamide (DEET). Toxicol Invitro 2008; 22(2): 548-52. Karr JI, Speaker TJ, Kasting GB. A novel encapsulation of N,N-diethyl-3-methylbenzamide (DEET) favourably modifies skin absorption while maintaining effective evaporation rates. J Control Release 2012; 160: 502-8. Speaker TJ. Microencapsulation products and process. United States Patent. Patent number: US 8039015 B2; 2011. Jabatan Standard. Methods of biological evaluation of efficacy of repellent–Bioassay method for mosquito repellent on human skin. Malaysian Standard: MS 1497. Malaysia: Department of Standard Malaysia 2000; p. 3. Guidelines for efficacy testing of mosquito repellents for human skin. Switzerland, Geneva: World Health Organization 2009. Available from: http://apps.who.int/iris/bit-stream/10665/70072/1/WHO_HTM_NTD_WHOPES_2009.4_ eng.pdf (Accessed on December 12, 2015). Phasomkusolsil S, Soonwera M. Insect repellent activity of medicinal plant oils against Aedes aegypti (Linn. ), Anopheles minimus (Theobald) and Culex quinquefasciatus Say based on protection mean biting rate. Southeast Asian J Trop Med Public Health 2010; 41: 831-40. Calton GJ, Siemer SR, Wood LL. Slow release insect repellents. United States Patent. Patent No. US 6180127 B1; 2000. Tawatsin A, Asavadachanukorn P, Thavara U, Wongsinkong-man P, Bansidhi J, Boonruad T, et al. Repellency of essential oils extracted from plants in Thailand against four mosquito vectors (Diptera: Culicidae) and oviposition deterrent effects against Aedes aegypti (Diptera: Culicidae). Southeast Asian J Trop Med Public Health 2006; 37(5): 915-31. Sritabutra D, Soonwera M. Repellent activity of herbal essential oils against Aedes aegypti (Linn.) and Culex quinquefasciatus (Say). Asian Pac J Trop Dis 2013; 3: 271-6. Rehman JU, Ali A, Khan IA. Plant based products–Use and development as repellents against mosquito: A review. Fitoterapia 2014; 95: 65-74. Emily ZRAW, Roger NS. Protection against mosquitoes, ticks and other insects and arthropods. CDC Health Information for International Travel (“The Yellow Book”). Atlanta: Centres for Disease Control and Prevention 2010. Tuetun B, Choochote W, Pongpaibul Y, Junkum A, Kanjanapo-thi D, Chaithong U, et al. Celery-based topical repellents as a potential natural alternative for personal protection against mosquitoes. ParasitolRes 2008; 104: 107-15. Correspondence to: Ms Norashiqin Misni, Department of Parasitology, Faculty of Medicine, University of Malaya, 50603 Kuala Lumpur, Malaysia.